Fruitful anti-terror cooperation between EU and Kurdistan: EU security officials confirmed to continue support Kurdistan Region’s security sector and war against terror. Photo (KRSC). Brussels, 29 November 2018 - Middle East Diplomatic - After visiting Kurdistan Region, EU Counter-Terrorism Coordinator Gilles de Kerchove confirmed extended EU support for security sector reforms in the Kurdistan Region. The cooperation is based mainly on Kurdistan Region`s war against ISIS terror. 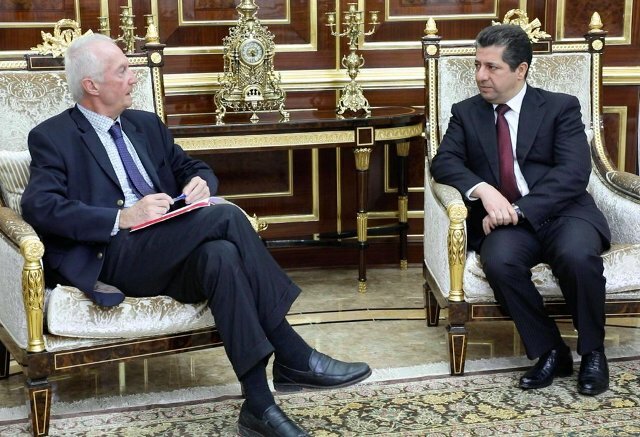 The meeting between Chancellor of the Kurdistan Region Security Council Mr Masrour Barzani and EU Counter-Terrorism Coordinator Mr Gilles de Kerchove took place in capital city of Kurdistan in Erbil. According Kurdistan Regions Security Council (KRSC), which is coordinating the oversees security and intelligence community in Kurdistan Region and coordinates coalition airstrikes against ISIL, both EU and Kurdistan officials agreed to cooperate more closely on war against ISIS terror. They had a substantive and productive exchange about the nexus between poor governance and extremism. KRSC statement underlined that Chancellor Barzani stressed the importance of addressing those underlying causes, many of them political. They emphasized the need for reconstruction and basic services in territories cleared from ISIL, rehabilitation programmes, and for regional countries to take a stronger lead combating extremist ideology. In the meeting, which was attended by EU Ambassador to Iraq Ramon Blecua, they also touched on the relationship between KRG and Iraq’s new government and mutual needs. In that regard, Ambassador Blecua confirmed extended EU support for security sector reform including to the Kurdistan Region.